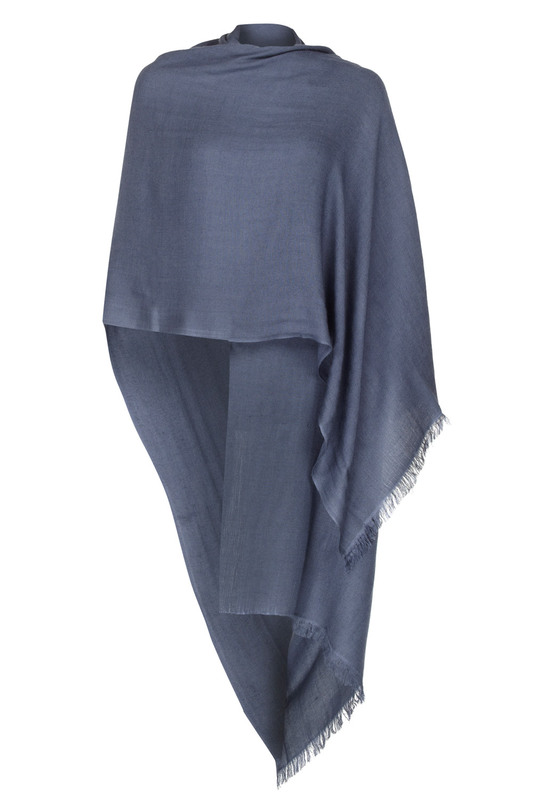 A slate grey cashmere and silk pashmina with a subtle hint of blue. Soft and fine yet warm this slate grey cashmere and silk pashmina will keep you warm and cosy on those cooler summer days and evenings. Worried about feeling chilly? And you want to look great too! Stay warm, look cool in a 50% Cashmere 50% Silk pashmina. Light and fine yet warm this slate grey cashmere pashmina shawl wrap scarf is ideal. Offering great value-for-money the cashmere and silk yarns breathe whilst giving warmth. Ideal as a wedding pashmina shawl wrap scarf and for other formal occasions, this slate grey pashmina shawl wrap scarf can be worn in so many ways. The ideal accessory. Our popular slate grey pashmina shawl wrap scarf in 50% cashmere and 50% silk. Stay Warm, Look Cool. Comments: I couldn't fault their service. From sending the samples to delivery, all communications were excellent and the pashminas really beautiful - just what I hoped for! Beautifully packaged and lovely quality product. Comments: Beautifully packaged and lovely quality product. Comments: Excellent product and service. Would recommend this website to anyone. Lovely fabric and quality. Comments: Three shades of blue sent and no dark grey but as they were Christmas presents there was no time to return the incorrect one and exchange. We did send the dark grey as requested, however, you felt it wasn't a good shade of grey. We have examined our stock and removed a few that were a dark blue-grey shade. Please accept our apologies and then you for your review.